Seen at Rowsley South on 4th October, 37188 was moved to Harry Needle at Barrow Hill on or about 4th November, for anticipated overhaul to return to traffic for Colas, although some way down the queue. 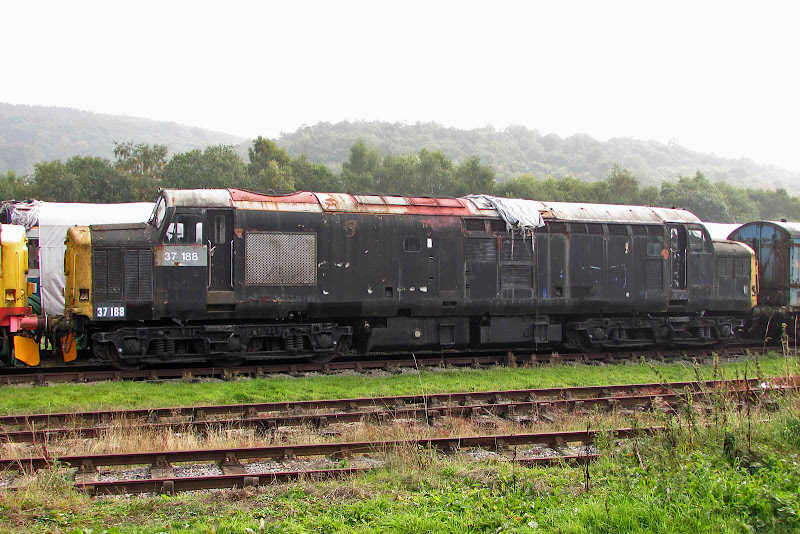 37188 was new in January 1964 as D6888, and allocated to Landore. Renumbered to 37188 in April 1974, From April 1982 this became a Scottish Class 37, staying that way, apart from a short allocation to Immingham, until February 1995. Into reserve from March 1996, and stored until purchased in August 2003, arriving at Peak Rail in February 2006. My notes show that I first saw this on 9th August 1987 at Fort William.